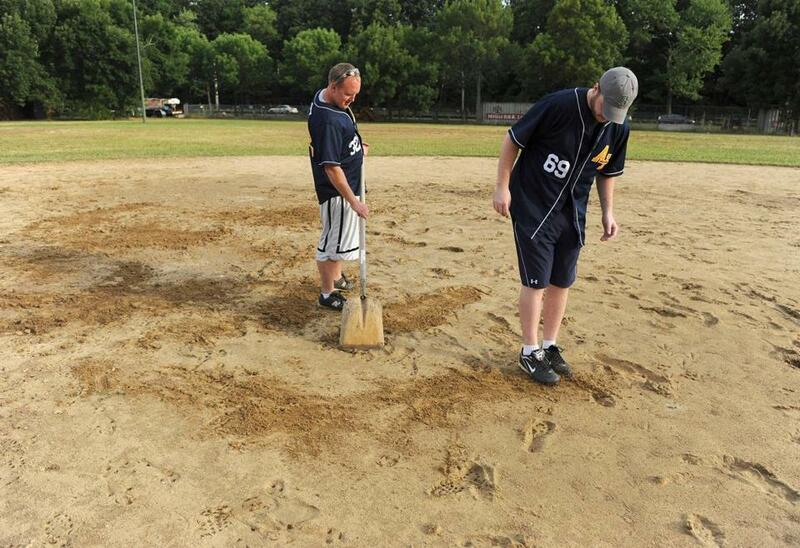 Scott Anderson (left) and Adam Vachon worked on leveling a part of Brighton’s Daly Field last week. A bill is being discussed to limit the field’s use at certain times to a few groups. A bill to allow Simmons College to build new sports fields in a state-owned Brighton park has drawn protests from environmental groups and park users who say the public could be shut out of the Charles River waterfront space. The Legislature could vote next week on the plan to lease the worn Daly Field for up to 30 years to a group that would give preference to Simmons College, the Brighton High School football team, and the Allston-Brighton Little League for practices. Simmons has agreed to spend $5 million to build two new fields, a running track, tennis courts, a river path, and other amenities at the site. The proposal comes as pressure builds for the private use of public lands in the state. With the state financially strapped, Massachusetts officials are searching for creative ways to maintain its vast array of public parks, swimming pools, ice rinks, and other public amenities. Meanwhile, space is at a premium at colleges, high schools, and other institutions, and many are looking to expand athletic fields. The bill was filed June 1, and though its sponsors said they aired it with community leaders in and around Brighton and held a legislative hearing, those who play on the field and environmental groups said they were unaware of the plan or learned of it only recently. “We feel for Brighton High School; they don’t have a place to play football, but the public needs to be involved in this decision,” said Bob Zimmerman, executive director of the Charles River Watershed Association. Now that the decades-long effort to clean the once-filthy river has the Charles sparkling most days, he said, boaters, visitors, and institutions are more interested in using the green space on its banks. Simmons College and Brighton-area politicians say local leaders support the project and there is a long process still ahead that will include public meetings over design and use. Simmons sought legislation because the state Department of Conservation and Recreation can issue a permit to use a field for a maximum of only five years, and Simmons needed a longer lease to justify its investment. Janet Fishstein, the school’s assistant vice president for administration, said the institution wanted assurance from the Legislature that the public-private partnership was viable before spending significantly on feasibility studies. The Brighton High football team used Daly Field until it fell into disrepair more than two decades ago, according to Moran. It has been looking for a permanent field since. Moran said the field is not greatly used, but those who use it said it is very popular with softball and soccer teams, among others. The state says the field is in use about one-third of the time by permit holders and is also used often for pickup games. The legislation explicitly spells out that Simmons will have full use of the field from 5:30 to 9:30 p.m. on weekdays from March to May and mid-August to November. The Brighton High football team would have practices from 2:30 to 5:30 p.m. weekdays and Friday nights from mid-August to November. The bill also carves out time for the Allston-Brighton Little League on weekday evenings from May to July. Saturdays would be time-reserved and shared by Simmons College, Allston-Brighton, and abutting communities. Sundays would be reserved for Allston-Brighton and abutting communities. 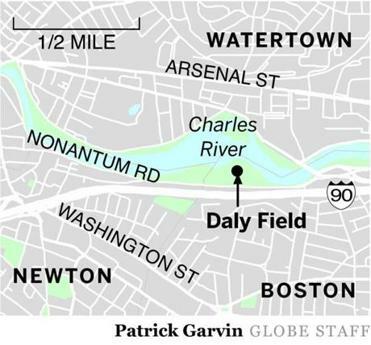 The field would be run by a group created for the purpose, called The Friends of Daly Field. In addition to rehabilitating the fields, Simmons would also give $500,000 for restoration work along the Charles River in Watertown. Other environmental groups weighed in on the proposal Thursday. The Massachusetts Rivers Alliance, a coalition of state river and environmental groups, said its members were concerned about how quickly the legislation was moving. George Bachrach, the Environmental League of Massachusetts president, said if the legislation passes, public access must be ensured. “On the one hand, the Simmons proposal allows for improvements and probably increases [use] of the fields, but whenever you sell or lease public lands, we need to be crystal clear in terms of continued public access — true public access,” he said. Beth Daley can be reached at bdaley@globe.com. Follow her on Twitter@Globebethdaley.